The United States is manipulating politics and attempting to exercise “19th century classical imperialism” in Afghanistan because it wants a “client regime” in Kabul, says an American antiwar activist. “What is painfully obvious is that the US and NATO want to maintain a client regime in Kabul,” Rozoff said. US Secretary of State John Kerry held meetings with Afghanistan’s two presidential candidates Abdullah Abdullah and Ashraf Ghani and incumbent President Hamid Karzai on Friday and Saturday, trying to strike a deal ending the deadlock over the June 14 election run-off between the leading contenders. 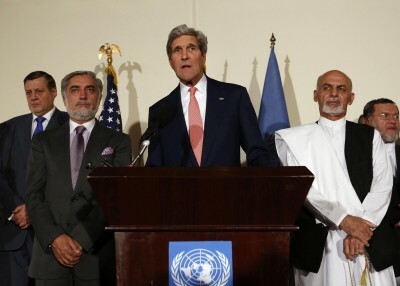 On Saturday, Kerry said the Afghan presidential rivals have agreed to a full audit of ballots. In a joint meeting with Ghani and Abdullah, Kerry said both candidates have accepted to stand by the eventual result of the audit.